Winship member William S. Dynan, PhD and the Dynan lab have been awarded a 3-year, $1.15 million NASA grant to investigate "Exosomes and secretory factors as mediators of non-targeted effects of HZE particles." High charge and energy (HZE) particles permeate the cosmos. When HZE particles pass through living cells, they elicit genome instability not only in cells that are directly traversed, but also in non-irradiated bystanders. Such nontargeted effects are an important contributor to radiation carcinogenesis, particularly at low doses and low dose rates. This project will investigate the role of microvesicles (exosomes) and other mechanisms of intercellular communication in explaining the effect. 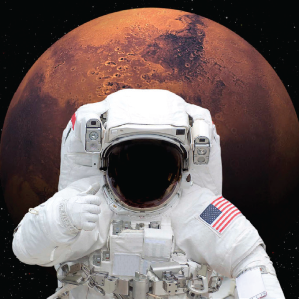 The work is part of a NASA program devoted to understanding and counteracting health issues that may be encountered in multiyear, exploration class missions to Mars or elsewhere in the solar system.